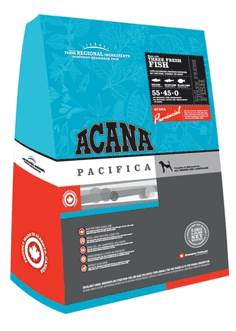 Acana Pacifica is a dry complete dog food from Canada. Because of the slightly lower protein ratio than its sister food Orijen, it has a lower price point but the same excellent quality. It is also a great alternative for dogs who find Orijen a little rich. Reflecting Canada's rich marine harvest, ACANA Pacifica is a world class grain-free dog food made with fresh Canadian Pacific salmon plus flounder and herring caught-wild off North Vancouver Island and delivered FRESH EACH DAY so they are never frozen and arrive without preservatives. 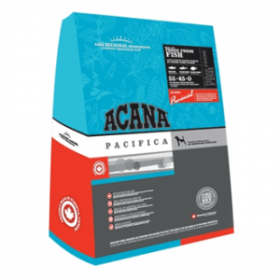 Made with a full 60% fish, ACANA Pacifica is crammed full of highly palatable, easily digested fish proteins to optimally nourish dogs of all breed and life stages.